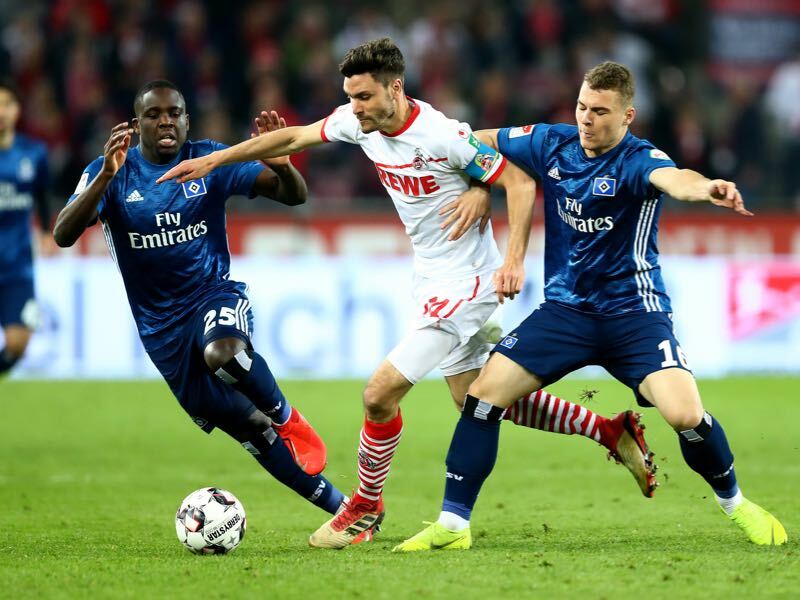 Köln v Hamburg — 1.FC Köln inched closer towards Bundesliga promotion after a hard-fought 1-1 draw against Hamburger SV at the RheinEnergieStadion. Dominick Drexler put the hosts in front midway through the first half, Hamburg substitute Manuel Wintzheimer slamming home the equaliser in the 85th minute. The home side were dominant in the first half, Dominick Drexler influential and deservedly putting Köln in front. Drexler couldn’t miss from close range after Marco Höger had flicked a Johannes Geis corner his way. It was a scrappy game, but Timo Horn had little to do as Hamburg struggled to create opportunities. Hannes Wolf’s team talk at half-time worked a treat as his side turned the game around and seized the initiative. Köln resorted to long balls from inside their own half as they lost control and were forced onto the back foot. It appeared only a matter of time before Hamburg equalised, it came through 20 -year-old substitute Manuel Wintzheimer after a scramble in the box following a corner. Despite failing to take all three points, Köln are still firmly in control of the Bundesliga 2 and in pole position for a swift return to the Bundesliga. The Billy Goats remain seven points clear of HSV and ten points clear of Union Berlin with five matches to play. With four of their final five matches coming against clubs in the bottom half of the table, there is little doubt they will be plying their trade against the best clubs in Germany next season. It looked beyond their reach at half-time, but Hamburg dominated the second half and celebrated their late equaliser like a victory. The point keeps them three points above Union Berlin and four points above Paderborn, two clubs with a far superior goal difference. With top scorer Pierre-Michel Lasogga injured, the goal scoring responsibility fell to Bakery Jatta, Khaled Narey and Berkay Özcan. In the end, it was little known Manuel Wintzheimer with his first goal of the season in just his second substitute appearance. Die Rothosen haven’t won in four Bundesliga 2 matches as they desperately hold onto the second automatic promotion place. Gideon Jung picked up a booking for a high boot just after the break and was fortunate not to receive his marching orders minutes later. Florian Kainz initiated a counter-attack, Jung taking the left wing-back down with referee Robert Hartmann awarding a free kick. It appeared a certain second booking, but despite the protests coming from the Köln bench and most inside the stadium, Hartmann decided it wasn’t worthy of a second yellow card. It was Jung’s last involvement in the match, Hannes Wolf recognising the fortune and subsequent danger with Jung taken off for Josha Vagnoman. Manuel Wintzheimer joined Bayern München’s youth academy as a 14-year-old and was prolific in the U17 and U19 teams. Deemed surplus to requirements, Wintzheimer moved to Hamburg on a free transfer at the beginning of the season and has had to bide his time. Playing predominantly in the Regionalliga Nord with the Hamburger SV II side, he recently registered his fifth goal in 16 matches in the 4-3 win against SC Weiche 08. Called up due to Hee-Chan Hwang and Pierre-Michel Lasogga being injured, Wintzheimer replaced Gotoku Sakai in the 81st minute and was Hamburg’s hero. Representing Germany from U15 to U20 level, this could be the start of more frequent appearances for the striker with Hamburg desperately in need of a focal point up front when Lasogga is unavailable.